TopVue Air are silicone-hydrogel contact lenses with a monthly replacement schedule. Their material ensures high oxygen permeability and water content, and they are enriched with sodium hyaluronate for added moisture and comfort. TopVue Air are the latest generation of advanced silicone-hydrogel contact lenses. They are highly breathable and retain the required water content needed for exceptional comfort. The lens design and technology guarantee comfort and visual clarity all day long. TopVue Air contact lenses are intended for daily wear with a 30-day exchange period. At night it is necessary to remove and store the lenses in a contact lens case filled with solution. TopVue Air monthly contact lenses are supplied in plastic blister packs. The solution is fortified by added sodium hyaluronate, which is a highly effective lubricating substance and has absolute compatibility with the physiological environment of the eye. This substance is completely natural to humans, therefore it does not cause any discomfort or undesirable complications (as may be the case for other wetting agents). Innovative technological processing provides TopVue Air high breathability by transporting atmospheric oxygen to the cornea, which proceeds through microscopic channels. The ability to transfer oxygen (transmissibility) is 100 Dk / t in TopVue Air. Another important parameter of all contact lenses is sufficient water content. Water is essential maintaining the hydration necessary for comfort of wear. TopVue Air contain 45% water content. Thanks to their high water content, they remain sufficiently hydrated throughout the day. This water content also helps reduce deposits on the lens surface. Notice the difference straight away when using these. Perfect lenses for comfort. Great comfort from these. Really breathable lenses and moist too. Can put them in a get on with my day without worrying about them. Can't recommend them. Completly doesn't work for me. Dries very quickly and at night cause flair around lights( annoying while driving). I felt better in standard TopVue lenses even with lower water content and oxygen permeability. Are these 2 weeks lenses or monthly? These style of lenses are monthly. 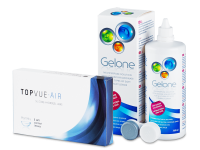 i've been a Biofinity believer for loads of years and im quite conservative/loyal in terms of shopping so it was an experiment for me to purchase Topvue air. first of all, the name wasn't so convincing but having seen that there are so many reviews from all the customers (not sure ALL of them are truly customers but anyway,many enough). so decided to buy alongside my regular to-go Biofinity pairs, and now to my surprise, im so satisfied with Top Vue air, haven't had slips on my eyes in mornings due to dryness since i started to wear them. if you're a long time contact lenses user, and need a long lasting yet comfy choice, then i'd defo recommend this. Nice lenses, very comfortable, and the price is right. Overall great upgrade from my previous biweekly lenses. Great lenses, and I appreciate the moneyback guarantee. I ordered the wrong prescription, and didn't realize until I'd opened them. You made the exchange quickly and easily. Top notch lenses, and service too. Very pleased with my purchase. High quality lenses, and delivered with no hassle at all. These topvue lenses have been a wonderful discovery. Budget friendly and comfortable, too. Comfortable lenses and reasonable price. What more can you ask for? These lenses keep my eye moist for whole day wear (I have dry eyes condition). These keep my eyes about the same comfort through out the month. highly recommended! Great monthly disposables. Comfortable for long days and easy to care for. Superior lenses and excellent customer service. I'm very impressed with your site and your follow-through. The lenses are super comfortable, also. I find these even better than the Acuvue Oasis, even if slightly more expensive. Bonus that they seem to be in stock and ready to ship when the Acuvue are not. Can't find any fault in these lenses. They're super comfy to wear, and the price is better than comparable brands. Highly recommend them! Very comfortable lenses, even in air conditioned environments. Always excellent service. And the TopVue lenses are brilliant. After a problem with delivery, your representative arranged a re-delivery for me with DHL, which worked perfectly. Excellent follow-through, thank you. My eyes can finally breathe! Great product, thank you. Gotta agree with Johny. The price is really good for monthly contacts..
Normal contacts - nothing special - well only special thing that I like about them is the price. Great to see a new product from topvue. Since changing from my old brand ive never looked back! Still fantastic prices also! Well Done! 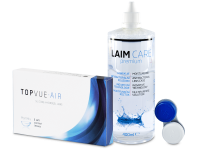 I have just recently changed from my old contact lense perscription to topvue air. I couldn't believe the difference, my eyes do not suffer from dryness anymore. Thankyou to lenses-contact for their help and speedy delivery service.